School is just a few days away, and I am planning meals and snacks for my big boy. Here is one favorite for moms and kids alike! 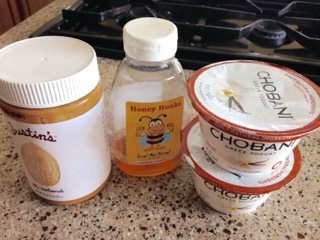 I am guilty of eating my kids' leftovers. Crusts of the PB and J. A handful of mini Ritz crackers. Maybe even a puff or two. So when we decided to change up our habits, we had to simply make better choices. I'm not going to lie - it was hard to switch from Oreos to fruit, but we learned to do it, and it became our habit. 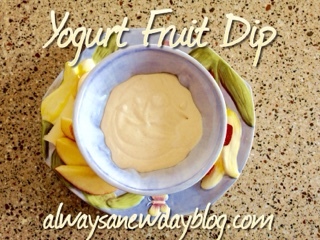 One of my favorite things to do with fruit is to dip it! This recipe has been a favorite of ours for a while, but I needed to clean it up a bit. Good-bye cream cheese and tub of whipped cream. No worries though, this cleaned up recipe is just as good. Blend all ingredients until smooth and creamy. Serve with apple slices, strawberry slices, and banana chunks. Kid and mommy approved! If you love Greek yogurt and want to see how to incorporate it into delicious recipes, check out these great eats HERE. See where I am linking up on Friday - check it out HERE and HERE. Yay! You and the kids will LOVE it.